Hi Everyone! The comments were accidentally turned off, but I think I have fixed the problem. Feel free to enter, and do check back on the evening of Dec. 12 (or the next morning). I’ll be announcing the winner and will need a United States mailing address. 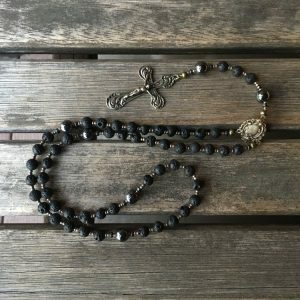 This is a beautiful rosary and I’d like to win, please. I, too, love oils and am excited to experiment with them in prayer. I’m beginning a new ministry and clinging to the Rosary is pretty good therapy for me right now. Thanks! I am named after the Virgen de Guadalupe. 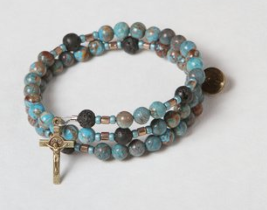 I would love to own this beautiful rosary bracelet. I would love to win because these are beautiful and the idea of thematic oils is genius. 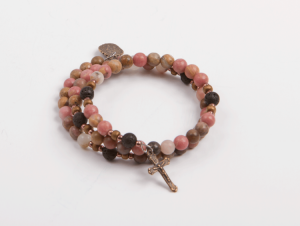 I would love to win this beautiful Rosary bracelet. It would be a constant reminder to start each day with prayer and faith. Wonderful interview, Lisa and Chantal. Combining oils with prayer is such a great idea. I would love to win your beautiful rosary because I’m making my Divine Mercy consecration on Dec. 12th. Please pray for me. I have a knotted rope Rosary that I will frequently wrap around my wrist when I have insomnia and start to pray. I usually fall asleep doing that. I would love to upgrade to an actual bracelet. I have also just started using doTERRA essential oil‘s, so incorporating those scents with prayer of the rosary sounds like a really beautiful practice. I have a life-long devotion to Mary and her rosary. I work in the catechetical field and think that teaching children to use all their senses while praying would be awesome! I have a special devotion to Mary and esp Guadalupe since I started dating my husband on this feast day! I would love to win this for my daughter. I have a rosary bracelet already, but my daughter is a teen, and I think having Our Lady with her would help her. My teen daughter helps to craft these and she loves to wear them as well. I hope your daughter gets the opportunity to enjoy the beauty, benefits and graces of wearing Our Lady’s Psalter. Lots of love and prayers! In November 2002, my 6 year old daughter suffered an arterial bleed in her brain during an intricate brain surgery. Her Godmother placed a large poster image of Our Lady of Guadalupe on the hospital room door. I prayed to Our Lady constantly during that frightening time as my daughter laid beside me in a drug induced coma. Her words to St Juan Diego- “Am I not your Mother” consoled my own maternal heart. My daughter was very unstable for two weeks and almost died many times. But on the Feast of Our Lady of Guadalupe- December 12th, 2002, the pressure in her brain stabilized. She was taken off the ventilator the next day and began to breathe on her own. To this day, the image of Our Lady of Guadalupe hangs in my daughter’s room as a reminder of Our Lady’s words and the miracles the Lord has done for us these past 22 years. Powerful!! Thank you for sharing! I am so grateful for your beautiful example and devotion – and friendship. I hope you are blessed with this beautiful rosary. The sorrowful blend is very appropriate as a reminder of the power of the Cross and Our Lord’s Divine Mercy. I was blessed to be able to visit the shrine of Our Lady of Guadalupe this past March with two of my daughters. I’ve always had a devotion to our Lady and just recently started using essential oils, so this seems like a brilliant idea. 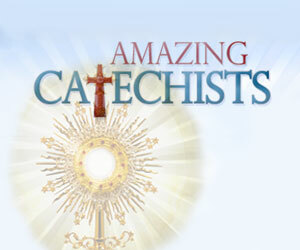 I would love to have one of your rosaries. 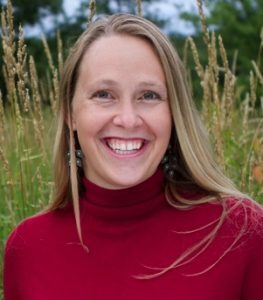 Susan – Thank you for joining in this special giveaway fun. I hope I too can visit Our Lady in Mexico one day! In the meantime I love how aroma and prayer can help us draw near to her. Blessed Advent! What a wonderful way to celebrate! Consecration to Our Lady is the short cut to the heart of Christ! Come follow us on social media and our website. I look forward to getting to know you better. Blessed Advent! Thank you for sharing your story. It’s very interesting. 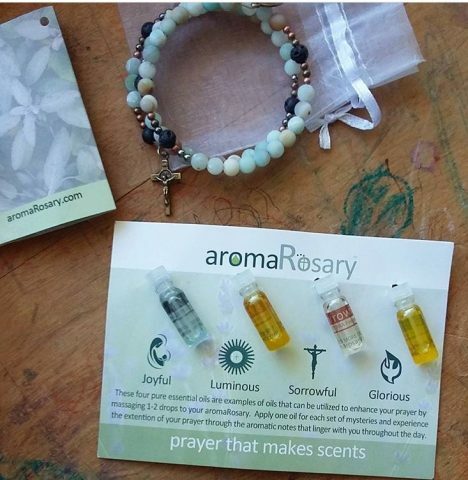 I would love to win an aromarosary bracelet. I use oils, homeopathic remedies, herbs and other natural products for health and well being. I have been doing this about 26 years. 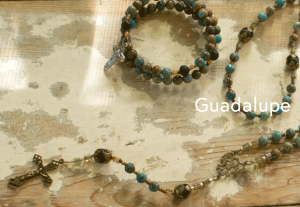 I am using the rosary more now and think I would really like the combination. I would love a bracelet like that to give away to one of our students. 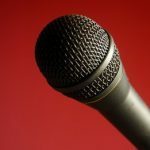 We have so many hispanic children in our English program and I am always looking for ways to connect to their homelife. I think this being such a big part of their culture it would be helpful. I’m so happy to discover you and read about your spiritual journey through the Byazantine Church. I grew up as a child when women wore veils to Mass and I love the Holy tradition. I have two veils which I cherish! I have been interested in learning more about pure essential oils and when I found out that your rosaries have essential oils I was hooked!! I’m hoping when I can I will purchase your rosaries for my sisters as gifts! 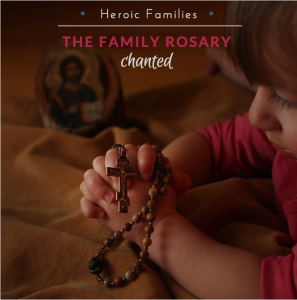 I would be honored to win one of your rosaries! On a side note my maiden name is Howard! We are related to General Oliver Otis Howard way back! Maybe we are related?!! God Bless you and your spiritual journey! Lets connect!! It sounds like we have many fun passions and connections to explore! Reach out to me and let’s visit more! Blessed Advent! I have a special devotion to Our Lady Under this title!! Just finished the Novena and Mass to celebrate the feast day.